PLEASE NOTE: Effective January 16, 2019, a cancellation fee of $25 will be assessed for any cancellations made less than 10 days before the training start date. Date: April 1 - 5, 2019 Location: McMinnville, OR. Date: October 7-11, 2019 Location: Bend, OR. Lions & Tigers and Flowers Oh My! For further information or inquiries, please contact OJDDA at: training@ojdda.org. This 32-hour introductory course is designed for Juvenile Justice probation workers/court counselors who are in their first year of employment. 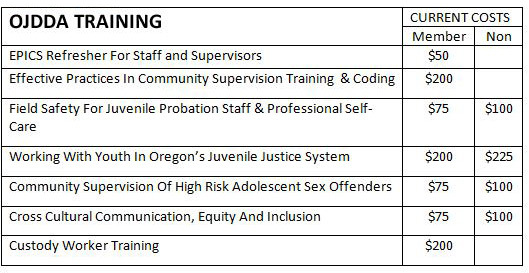 The topics are designed to give participants a general overview of the basic skills utilized in the day-to-day operations of Juvenile Justice. The presentations will provide an opportunity for learning through lecture, discussion, and demonstration, following evidence-based best practices and cultural awareness. This course is also an opportunity to network with other probation workers/court counselors from around the state. Certification form that will need to be filled out by a director or supervisor from the county requesting certification. Once completed, send the form to ​training@ojdda.org.